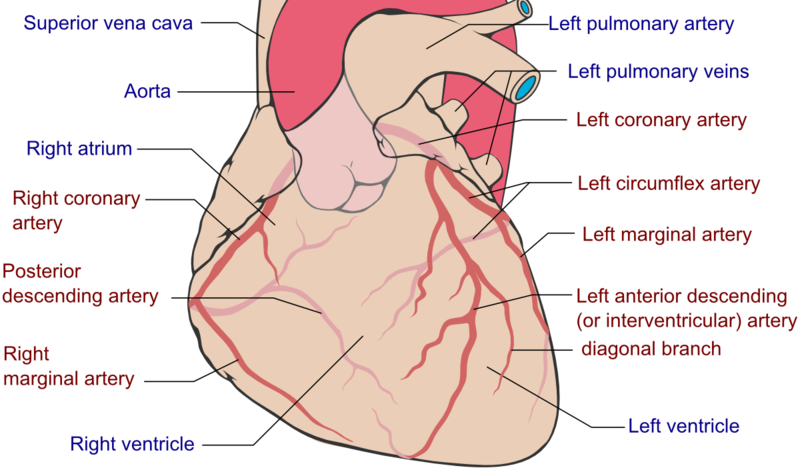 The heart is a muscular pump located in the thoracic (chest) cavity. It is constantly working to circulate blood throughout the body. During times of physical exertion or emotional stress, the activity of the heart increases. Due to its constant action, the heart needs a good supply of oxygen and nutrient rich blood to sustain the muscle tissue. This is supplied to the heart via the coronary arteries. The coronary arteries branch off from the major artery of the heart – the aorta. 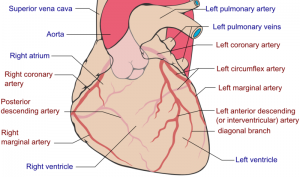 There are two main coronary arteries, namely the right and left coronary artery. It arises from the aortic sinuses above the aortic valve just as the ascending aorta leaves the heart. Each coronary artery gives off a number of branches that supply the entire heart. The coronary artery distribution may vary, sometimes slightly or at other times significantly, among people. Depending on where the posterior descending artery originates, the heart’s blood supply may be right-dominant, left-dominant or co-dominant. Most people (approximately 70%) are right dominant meaning that the posterior descending artery arises form the right coronary artery. About 15% of people are left dominant meaning that the posterior circumflex artery arises from the circumflex branch of the left coronary artery. In about 20% of people, the area supplied by the posterior descending artery is supplied by branches from both the right coronary artery and the circumflex branch of the left coronary artery. This is known as co-dominance. Sinoatrial node supplied by the right coronary artery or left anterior descending branch of the left coronary artery. The circumflex branch arises from the right coronary artery.